Longlevens was once a village and still has a community spirit. We hope the surgery is part of that community and aim to provide a personal and friendly service in the group practice setting. We moved to our new purpose built premises in March 1991. A recent extension in 2016 has provided us with much needed adminstrative and Consulting room space, with the addition of a second floor and lift access. As a Training practice we have regular Trainees on placement from 6 months to 12 months and also Medical students. Dr Makanjuola & Dr Kindler are our resident Trainers. We accept patients from the Longlevens and surrounding areas. Please contact us for further information should you wish to register here. We hope our website will be able to provide you with the information you need to get the best understanding and therefore, service from us. Suggestions from our patients is something we do encourage as it enables us to look at what we are providing and how we can possibly improve. 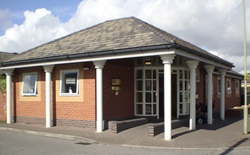 The surgery has a ramp located outside the front door and DDA compliant lift for access to our second floor consulting rooms. The ramp allows wheelchair access or for those with mobility problems. A bell is also located on the front door to raise help from reception staff if needed. A portable hearing loop for the hard of hearing is also available. We also provide hand rails to assist patients whilst inside the surgery, a disabled toilet and access to a low shelf in reception for patients to use if in a wheelchair. If further assistance is required please let us know.